Wooo Hooo thank you to everyone who entered our first Creative Cowgirl Challenge. If you pop over to Creative Cowgirls Challenge tomorrow you will find out who our first winner is. This week we are having another ANYTHING GOES challenge. and she is giving the winner a $10 coupon to spend in her great shop. She is also giving the Top 3 1 image of their choice. After all this I nearly forgot to post my card. I used 12 x 12 Papermania card cut to a 6" square base with dotty paper from DCWV paperstack 6. I coloured the image with Promarkers and shaded with distress inks. Martha Stewart loop punch and Woodware flowers. The thing I really like about Terry's image is the infectious smile. I defy anyone to look at one of these images and not follow suit and smile. Hop over to the Challenge and enter your fabulous creations. Hello Poppet. I love your card, so beautifully co-ordinated, fab papers and the image is coloured so well. Happy crafting. Poppet, you are so wonderful! Thank you so much for the promo - I'm glad you like our images! 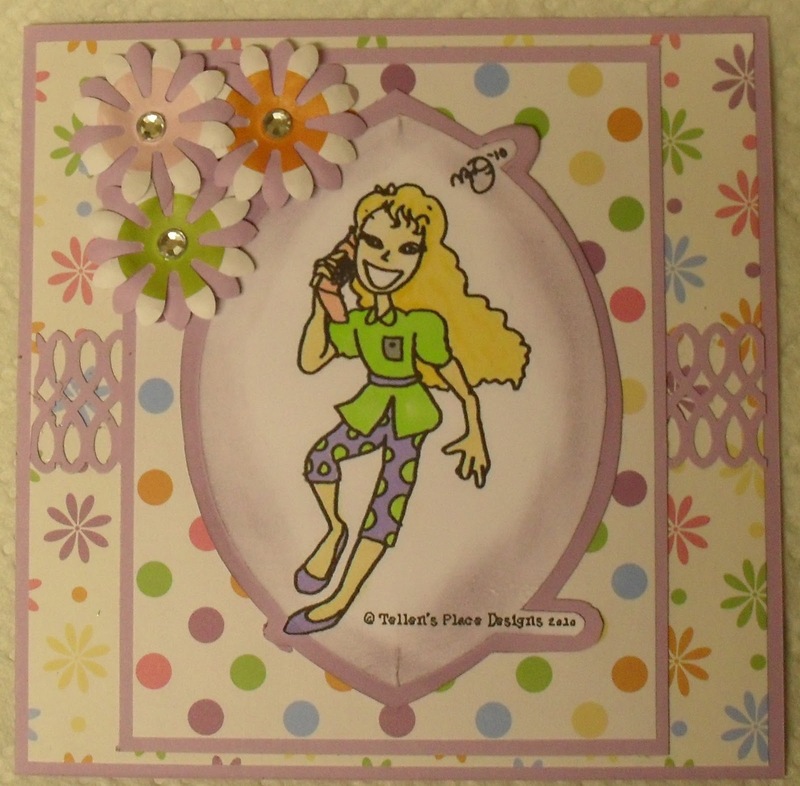 You did such a wonderful job with this pretty card; so lively and cheerful! I love the polka dotted paper and the MS border punch - divine! Your flowers are so creative too! Thanks for being so creative with our TPD image! Hey!!! You are the lucky winner over at Incy Wincy Designs challenge - go check it out!!! CONGRATS!!! !